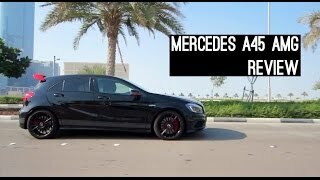 Mercedes-AMG embarking on a new era with it offering a fascinating high-performance vehicle in the compact class for the first time in the company’s history extending back to over more than 45 years. 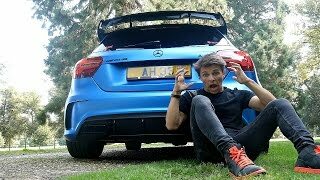 The 2014 Mercedes Benz A45 AMG is the most dynamic, powerful and efficient four-cylinder series production car. 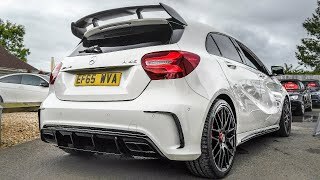 With its impressive high-tech package and the performance-oriented AMG 4MATIC all-wheel drive, the A45 AMG is a thoroughbred AMG through and through. It is powered by the newly developed AMG 2.0-litre turbo engine which is the most powerful series production four-cylinder turbo engine in the world giving a maximum output of 360 hp and up to 450 Nm of torque. These figures are unmatched by any other mass-produced turbocharged four-cylinder engine worldwide. 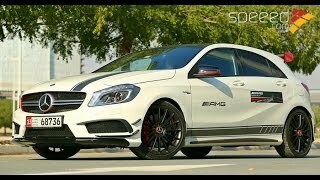 the A45 AMG accelerates from zero to 62 mph in 4.6 seconds, while its top speed stands at 155 mph (electronically limited). The specially developed AMG engine is also a model of efficiency, with fuel consumption of 40.9 mpg in NEDC combined mode. This is accompanied by particularly low exhaust emissions and it complies with the EU6 emissions standard which is not scheduled to enter into force until 2015.